As I’ve said many times before, I love my blog because it allows me to work with brands and find out about new products that I might not have necessarily come across. Code Beautiful is a British brand that has a celebrity following and the mascara you see pictured above has just launched on QVC – the biggest shopping channel, so let’s see how I got on with this mascara! It’s not often that we’ll see a mascara come in such a box – the attention to detail is wonderful and just look at the contrasting but beautiful colours – white, black and hot-pink! For me that’s a big bonus!!!! 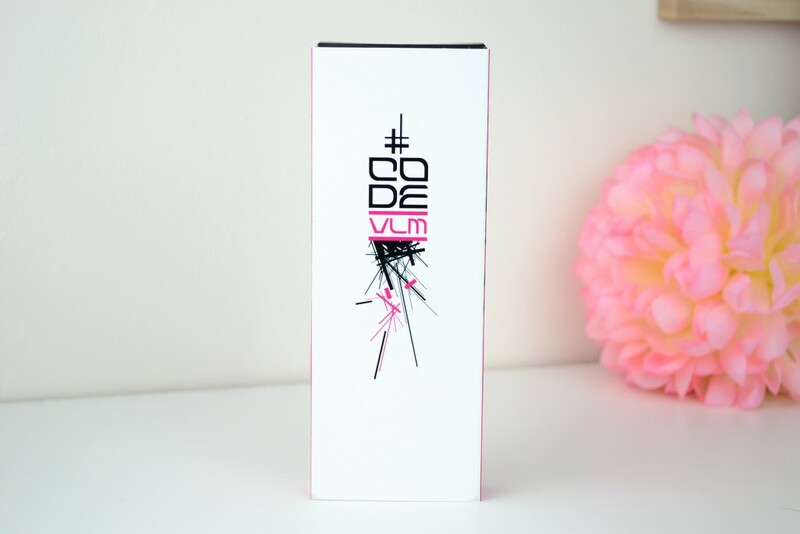 The CODE Beautiful VLM Mascara is a glossy, fibre-based mascara designed to give lashes lift, length, curl and volume. The technology allows you to build up layers (coats) for the look you want to achieve taking you from day to night in a few sweeps. No-smudge, No-clump, Water-proof – NO Parabens and NOT Tested on Animals. As you can see in the pictures this isn’t your typical wand – it’s designed to reach all your lashes including them pesky baby lashes too! CODE Beautiful tells you “Roots, Wiggle & Roll” to build up your lashes – I’m not a fan of this technique and just prefer the normal method of applying mascara to your lashes BUT give it a go, what might not work for me, might work for you! As I’ve tried to show you in the pictures above, the wand has both fine and thick bristles which is something that’s quite unique – this allows you to get longer, thicker looking lashes in just a few sweeps! As a lot of you know, if I could take only ONE product to a dessert-island it would be my mascara but the downside is that I’m super-fussy when it comes to reviewing mascaras! If you’re like me and love really thick, full lashes then you’ll need to apply 2-3 coats for the desired effect. With one coat my lashes look a lot longer but not thicker so this type of look is PERFECT when it comes to the no-makeup “makeup” look – it just defines your lashes for a really natural look. After applying 2-3 coats I could see a difference, my lashes looked full, thick and really long – reaching to just under my brow and it lasted ALL day too! You can purchase the CODE Beautiful VLM Mascara from QVC for £17.00 and even though it’s on the pricier side you will love the results! If you have tried this I would LOVE to hear from you so please let me know what you think! Hi hun, I’m a fan of QVC and seen this mascara a few times but not yet tried. I have tiny weeny lashes so reading your post has made me want to get one and it’s great they don’t test on animals too. Η συσκευασία είναι πολύ ιδιαίτερη και μίνιμαλ! I’ve never tried anything from CODE Beautiful. I really like mascaras that lengthen – volumizing mascaras can sometimes seem clumpy. Great review! This does sound good, but I think the price would put me off a bit! Sounds like a great product! And I LOVE that it isn’t tested on animals. That’s always a big plus!